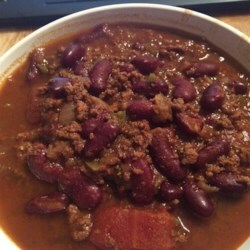 For those wanting a thicker chili - Reserve a 1/2 cup or so of the beans and mash them before adding to the chili. This will thicken the chili. Or just wait until the chili is done and smash some of the beans against the side of the pot. You can also decrease the amount of water in the recipe to suit your taste.